When someone makes an allegation of sexual assault, it sparks all types of people into political activity whether it be because they are survivors of sexual assault themselves or perhaps they are just still mad they lost the election. I'm going with the latter when it comes to the woman featured in this video shared on Twitter by Benny Johnson at the DailyCaller. 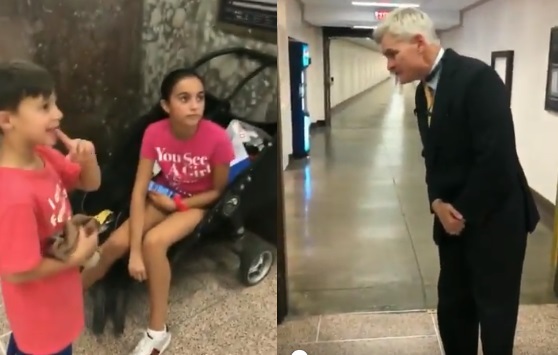 The video shows a woman ambushing Sen. Bill Cassidy of Louisiana and asking with a snarky attitude, "Senator Cassidy, can you please apologize to my children for ruining their futures?" Cassidy's response might have been one of the greatest things I've ever heard because he not only shuts down the out of control mother but he gives some truly reassuring advice to the two young children. Cassidy replies, "Guess what? Your parents are using you as tools. In the future, if somebody makes an allegation against you & there’s no proof for it, you'll be OK."
The woman who can be heard talking behind the camera has been identified as anti-Kavanaugh protester Alethea Torrellas Shapiro. What she didn't expect was the response she would get would go viral and not because of the reasons she wants. Shapiro interrupts Cassidy saying, "No, we’re not using them as tools! We’re not using them as tools!" Clearly, Shapiro just used her children as political pawns signaling to Cassidy what type of person he is dealing with and offers some true to the heart advice that should actually help build faith in the American justice system. "— but in the future, if somebody makes an allegation against you, and there’s no proof for it, you will be okay. Thank you." This delightful, spirited woman posted on Facebook shortly before the video was taken that she planned on "bird-dogging in the Senate with all 4 of my kids." Birddogging in case you've never had the pleasure of hearing the term outside of a hunting context means "to follow, watch carefully, or investigate." So clearly, Shapiro had political motives planned for her children or she wouldn't have made the post and accosted Sen. Cassidy. It turns out Shapiro is a so-called activist who calls extremist feminist activist Linda Sarsour her hero. The DailyCaller reports that Shapiro regularly goes on profanity-filled tirades against GOP senators such as Cassidy and Chuck Grassley. I guess Shapiro had to leave without her apology that she demanded on behalf of her children since she already decided in her mind that they are going to grow up to be victims because that is the liberal mentality. The "Woke" victim-hood that children are being indoctrinated into that teaches that penguins can be gay and there are no biological differences between men and women are going to grow up to be very bitter towards their parents' generation when they realize they've been brainwashed into believing their liberal lies instead of teaching them to use logic and critical thinking to think for yourself. Shout out to Kanye West! Those women are the mindless minority. As is the hate type commentary. Like a zombie after something it can never have. Hey, negative commenters…Write your own piece about abandoning common sense to serve your masters. Find truth, seek it out. Side with good not evil. Listen not to words, but follow the actions. One side tends to tell us what we want to hear while acting in actuality against all. Stop playing for the wrong team & us morality & common sense as your compass. The point is xtremely clear. Ambushing elected officials for sound bites and playing political games using kids is low and shows the opposing side is desperate.